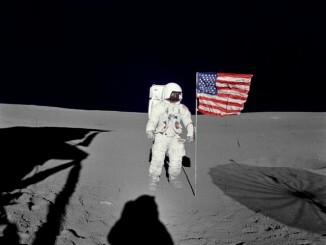 Famous for attempting an experiment in extra-sensory perception on his way back from the moon, Mitchell founded the Institute of Noetic Sciences in 1973 “to support consciousness research and promote awareness of evolving human consciousness,” the family said in a statement released by the Astronaut Scholarship Foundation. It was a lifelong interest. Born Sept. 17, 1930, Mitchell grew up in Artesia, N.M., near Roswell and learned to fly as a teenager, washing planes at a nearby airfield in exchange for flying lessons. As a Navy pilot, he completed two tours of duty during the Korean War and went on to earn a doctorate in aeronautical engineering from the Massachusetts Institute of Technology in 1964. Two years later, he completed test pilot training at Edwards Air Force Base, Calif., graduating first in his class. That same year, he was selected as a NASA astronaut. After extensive training and a stint as a backup crew member for the Apollo 10 mission, Mitchell was named lunar module pilot for Apollo 14, NASA’s fourth moon-landing mission and the first after the Apollo 13 crew suffered a near catastrophic explosion en route to the moon. 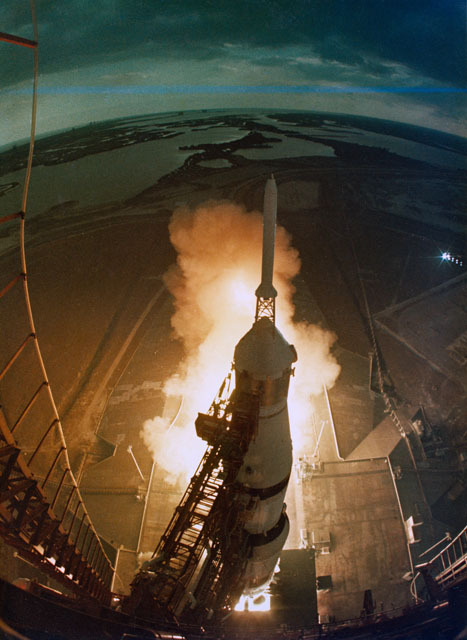 On Jan. 31, 1971, Mitchell, Alan Shepard and Stuart Roosa blasted off from the Kennedy Space Center aboard a Saturn V rocket and headed for the moon. On Feb. 5, leaving Roosa, the command module pilot, behind in lunar orbit aboard the Kitty Hawk capsule, Shepard and Mitchell descended to a landing in the Fra Mauro highlands. During a 33-hour 31-minute stay on the surface, Shepard and Mitchell carried out two moonwalks totaling a record nine hours and 17 minutes and collected nearly 100 pounds of rock and soil samples for return to Earth. During their stay on the surface, Shepard famously hit a golf ball with an improvised six iron and Mitchell threw a jury rigged javelin to demonstrate the moon’s low gravity. Mitchell and his crewmates returned to Earth on Feb. 9, logging 216 hours and 42 minutes in space. Shepard, one of the original seven Mercury astronauts, died in 1998 after a successful post-NASA business career. Roosa died in 1994. 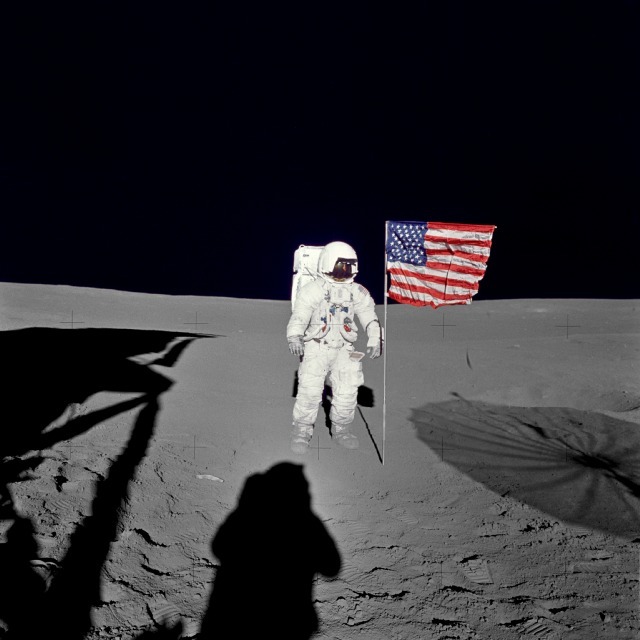 “It’s the 45th Anniv of the #Apollo14 landing on the moon & yesterday we lost another Lunar Pioneer Edgar Mitchell,” Apollo 11 astronaut Buzz Aldrin tweeted. “He was incredibly generous with his heart and his brain, making each of us a better person because we knew him and were shaped by him,” she said. “The lessons of hard work, integrity, curiosity, as well as a deep understanding that all things are possible, is embedded in each of us,” she said. Mitchell retired from NASA in 1971 and founded the Institute of Noetic Sciences two years later. “In retirement Mitchell wrote extensively on human consciousness,” the family said. “His book ‘Psychic Exploration: A Challenge for Science’ (1974) became an essential reference for consciousness researchers. Mitchell’s ‘The Way of the Explorer’ (1996) offers an autobiographical account of his interest in human consciousness. Mitchell is survived by daughters Karlyn and Elizabeth Kendall; his adopted children Kimberly, Paul Mitchell and Mary Beth Johnson, nine grandchildren, one great-grandchild and several nieces and nephews. Arrangements for a memorial service were pending Friday afternoon. The family requested, in lieu of flowers, donations to the Astronaut Scholarship Fund, the Institute for Noetic Sciences or Eterna Inc.